Sorry this blog is behind ,,,, Its still under construction, be back soon !! WAITING FOR ANSWERS MEANS YOU WILL NEVER LIVE THE SAME AGAIN! f you know something that would help these families , including ours, please don't sit quietly by and let us suffer. We are just people who love our families just like you love yours. Please help us find some measure of peace. in time for Diamond's birthday which is this Monday. The girls were last seen in 2001 and their family is still reeling from their disappearance. We know first hand that the CPD has followed up with every lead and there were hundreds. Entire file cabinets full of paperwork still with no answers. Now is the time to come forward. It's the people that help solve the crimes! If you know something please don't hesitate to call. You will remain anonymous. Please share this post, thank you. SOUTHSIDE, W.Va. — The mystery surrounding the disappearances of three people in Mason County has caused anguish for families, an official police investigation and a grassroots movement to assist in solving the case. Mason County Sheriff David Anthony confirms husband and wife William “Jeff” and Ashley (Baird) Crawford, as well as Ashley’s cousin Tonda (McCarty) Nelson, have been missing since around June 17 and remain missing persons. The Mason County Sheriff’s Office continues to follow up on several leads to solve the case with Anthony explaining there are “a lot of rumors floating around about the case but no factual evidence to prove where they are.” Deputy T. Powell is the lead investigator on the case. Where they are remains the big question. What is known is the Crawford’s mobile home located on Jeffers Ridge in Southside, W.Va. was destroyed by what investigators called a “suspicious” fire in the early hours of June 17. A few days later family members reported the couple missing, Nelson was reported missing shortly afterwards — she was said to have been last seen with Ashley around June 16. Investigators state there’s been no cell phone or bank activity from any of the three individuals since they went missing. The Crawford’s vehicle, which was located by investigators reportedly in Mason County, has been impounded by the sheriff’s office. Investigators are dealing with various scenarios, including: foul play being involved in the disappearances; the trio hiding out from some danger; or the trio starting a new life based on initial reports from family and friends who say the Crawfords expressed a desire to leave the area and move south, possibly to South Carolina or Alabama. However, family and friends have obviously become concerned these plans to move were foiled because no one has heard from the Crawfords or Nelson since their disappearances. Jeff’s mother reportedly told the sheriff’s office her son had changed his mind about leaving which has only deepened the mystery as to the trio’s whereabouts. In addition to the investigation being conducted by the Mason County Sheriff’s Office, family members have also begun a grassroots campaign to assist in finding answers to the whereabouts of their loved ones, using flyers and Facebook. The family of Nelson, 27, has flyers on Facebook which describe her as a “mother of three, 5’ 6” tall, 135 pounds, blond hair, blue eyes, last seen with Ashley.” The flyer asks those with information to contact Connie and Johnny McCarty, 304-675-1351. 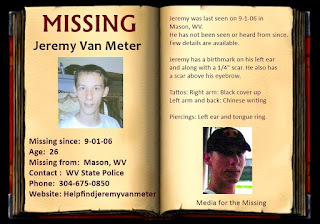 The family of Jeff Crawford, whose 29th birthday was June 29, has been circulating a Facebook post asking that anyone with information on Jeff, Ashley (who is 26 years old) or Tonda can contact them anonymously with their information or tips at PO Box 73, Point Pleasant, WV, 25550. Of course the Mason County Sheriff’s Office remains the lead, official investigative body in this case and personnel are also asking the public call them with information and/or leads at 304-675-0850. GALLIPOLIS FERRY, W.Va. — After two days of careful excavation surrounding the area where human remains were found in Mason Co., W.Va., over the weekend, investigators with the West Virginia State Police Crime Scene Team have confirmed that two bodies were found on site and have been identified as Tonda (McCarty) Nelson and Ashley (Baird) Crawford. According to officials, the two women, along with Crawford’s husband William “Jeff” Crawford, have been missing since June 17, 2011. Mr. Crawford’s whereabouts are still unknown. “We are now dealing with a homicide investigation,” said Sgt. E.B. Starcher of the Mason County Detachment of the West Virginia State Police. Investigators have also released that the remote site where the two women were found is owned by a family member of Matthew Woods. Woods, also of Gallipolis Ferry, was arrested Friday on charges of first degree murder in the shooting death of Rene A. Gonzalez. As of press time, investigators say the two cases are not connected. Starcher reported Sunday that the human remains of at least one person had been found that evening, around 8:30 p.m., just off of Duncan Creek Road in Gallipolis Ferry. From that time, until the early morning arrival of forensic specialists on Tuesday, the West Virginia State Police Crime Scene Team closed the road to traffic and secured the site of the shallow grave that had been discovered by a group of people walking through the woods. Forensic specialists from the Smithsonian Institute in Washington, D.C., arrived on site Tuesday morning to help state police process the scene. They have since completed the work of processing the Duncan Creek scene. Mystery has shrouded the case since the trio’s disappearance, and known details seem to only lead to more questions. The Crawfords’ mobile home located on Jeffers Ridge in Southside, W.Va. was destroyed by what investigators called a “suspicious” fire in the early hours of June 17. A few days later, family members reported the couple missing, and Nelson was reported missing shortly afterward — she was said to have been last seen with Ashley around June 16. The Crawfords’ vehicle, which was reportedly located in Mason County by investigators, has been impounded by the sheriff’s office. Investigators had considered various scenarios before Sunday’s grim discovery and Tuesday’s confirmed identification of Crawford and Nelson, including the trio hiding out from some unknown danger or the trio starting a new life, based on initial reports from family and friends who say the Crawfords had expressed a desire to leave the area and move south, possibly to South Carolina or Alabama. It is now known that foul play was certainly involved in the disappearances; what isn’t known is the whereabouts of the third missing individual — William “Jeff” Crawford. Investigators report that no cell phone or bank activity has been detected since the three vanished. The family of Jeff Crawford, whose 29th birthday was June 29, has been circulating a Facebook post asking that anyone with information on Jeff contact them anonymously with their information or tips at P.O. Box 73, Point Pleasant, W.Va., 25550. The West Virginia State Police is leading the investigation of the deaths of Nelson and Crawford, as well as the ongoing search for William “Jeff” Crawford. 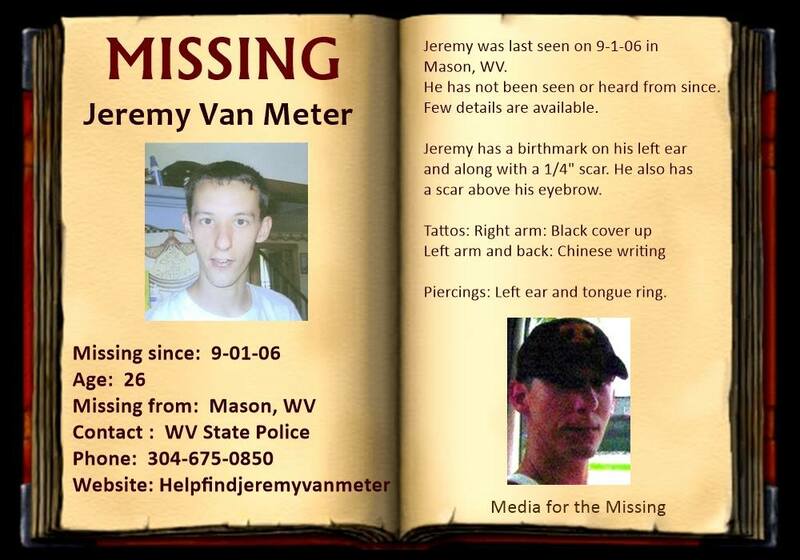 Anyone with information may contact them at (304) 675-0850. Links to Law Enforcemant and Government sites that run the Code Amber Ticker. Alerts and Amber Alerts that have not been canceled. is dedicated to stoping crimes against children. Links to searchable registries by state. The latest news and press releases from Code Amber. Our current supporters and sponsors. Instant Amber is a child safety service that securely stores information and can be immediately provided to Law enforcement in an emergency. This Web site is a non profit web site, and in no way affiliated with the Office of Juvenile Justice and Delinquency Prevention, Office of Justice Programs, U.S. Department of Justice. Neither the U.S. Department of Justice nor any of its components operate, control, are responsible for, or necessarily endorse, this Web site (including, without limitation, its content, technical infrastructure, and policies, and any services or tools provided). 16 month old baby Alissa was murdered. Judy Rollins Hoschar / Judy Lee Rollins. Awesome Inc. theme. Powered by Blogger.